There's no state quite like Alaska. Located apart from the rest of America, up in the northwest corner of the continent, Alaska is the biggest state of all but has the third smallest population, making it the most sparsely populated state. The low population of Alaska is naturally related to its low temperatures and glacial conditions, with large parts of the state being covered by icy lakes and snow-topped mountains, including Denali, the highest peak in all of North America. The fishing and oil industries have been huge factors in the development of Alaska's economy over the years, but the state is developing a growing reputation as a popular touristic destination due to its pristine condition, rich array of wildlife, and stunning snowy scenery. Many people see Alaska as a prime place to explore the wilderness and enjoy some old fashioned adventures, with the likes of kayaking, fishing, hiking, and climbing being very popular activities in the state known as 'The Last Frontier'. 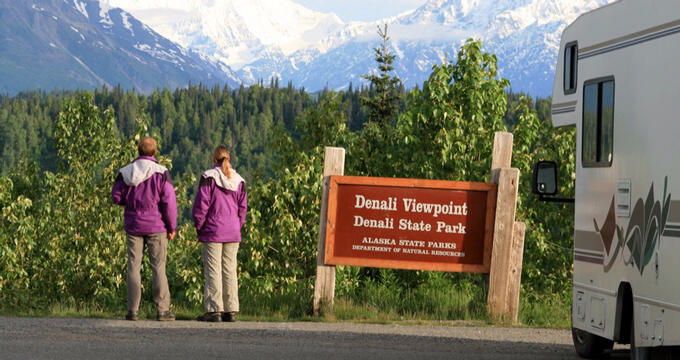 So, whether you're visiting Denali, exploring the outstanding Kenai Fjords National Park, looking out for some amazing wildlife at the Glacier Bay National Park, or visiting one of Alaska's big cities like Juneau or Anchorage, you'll find that this state has a lot to offer and is becoming increasingly popular with RV enthusiasts too. There are several excellent RV parks situated in key locations all around Alaska. Read on to learn more about the best RV parks in Alaska and start planning your trip to the Last Frontier today. The southern coast of Alaska is an amazing and beautiful place, and it's also where you'll find some of the state's most charming fishing towns and cities, with Homer being a fine example. Heritage RV Park, one of the top rated RV parks in all of Alaska, is located in Homer on Kachemak Bay. Local attractions include the Pratt Museum, the Center of Alaskan Coastal Studies, the Homer Spit, and the Alaska Islands and Ocean Visitor Center, with Kachemak Bay State Park only a short journey away as well, so this is an excellent RV park to choose if you want to see some of the most beautiful places in Alaska and soak up some local culture in a popular little city. Heritage RV Park has received lots of positive reviews from past guests, with many people speaking favorably about this park's stunning views and useful facilities. The RV sites are all nice and spacious at this RV park, with full hook-up utilities and 30/50 amp power, as well as free Wi-Fi access for all guests. The park itself is a fairly no-frills location, so you won't find too many amenities here, but you do have access to the basics like hot showers, clean toilets, and a modern laundromat with coin operated washers and dryers to keep all your clothes fresh and clean. This park also offers beachfront RV sites and direct beach access for activities like beachcombing, shelling, birdwatching, and fishing. One of the main reasons people visit Alaska is to admire and appreciate the incredible power and beauty of North Amercia's tallest mountain: Denali. Standing at an astonishing height of 20,310 feet (6,190 m) above sea level, Denali, once known as Mount McKinley, is simply a must-visit location not just for mountaineers and climbing enthusiasts, but for anyone who wants to see one of the world's most impressive and imposing peaks, and you can see it all at Denali RV Park & Motel, which is actually located right in the Denali National Park and Preserve. By far one of the top RV parks for people hoping to visit Denali, Denali RV Park and Motel offers spacious RV full hook-up sites from as low as just $54, with both pull-thrus and back-ins available. All RV guests at this location will get access to the park's amenities, which include a great gift shop selling plenty of useful items and souvenirs, an outdoor cooking area to enjoy BBQs and picnics with your pals, a laundry room with washers and dryers, direct access to many hiking trails, a large meeting area for gatherings and rallies, free internet access, dozens of cable TV channels, and a concierge service that can help organize tours and adventures around Denali. Sitting on the banks of the Matanuska River and home to the Alaska State Fair, the little city of Palmer is a great place to spend some time on your trip to Alaska, and that's exactly where you'll find the Big Bear Campground & RV Park. Enjoying amazing mountain and river views all around, this RV park is perfectly situated for many different kinds of outdoor recreation and fun activities like horseback riding, climbing, hiking, fishing, and more, being nicely located not far from the Nancy Lake State Recreation Area and the Chugach State Park. This RV park is also quite convenient for people wishing to take a trip into Anchorage, with Alaska's biggest city being about 45 minutes away. Big Bear Campground & RV Park is open all year long and is a family owned and operated location with warm welcomes and friendly atmosphere guaranteed every time. The park is very clean and safe, perfect for all kinds of camping. You'll find a total of 47 RV sites on this beautifully landscaped and neatly laid-out RV park and campground, with various different kinds of RV site to choose from including pull-thrus and back-ins. Big rig friendly sites can be found here, and most sites feature full hook-up services with 30/50 amp power, fire rings, and picnic tables. Other amenities at this location include a play area for kids, a huge laundry room with washers and dryers, a communal lounge area with chairs and a big TV, a library for books and videos, a game area, hot showers, a propane fill-up station, and a picnic pavilion too.